Lighting-Gallery-net - high pressure sodium/EYE 50w Daylux and screw in ballast adapter quite a find! EYE 50w Daylux and screw in ballast adapter quite a find! Very hard to find. The Daylux is what you call a "white HPS" lamp. They require special ballasts, as such lamps operate on lower voltages, higher current than standard HPS lamps. That is definitely rare. I've never seen, or even heard about this type of lamp before. A video of this lamp in action would be awesome! Wow...what a find! Looks like there's one left here on eBay. I know only Eye Specialux and SDX white HPS lamps. Nice lamp Dave, and quite rare too. There also was a third component that came with it: a pressed aluminum reflector with a front glass. 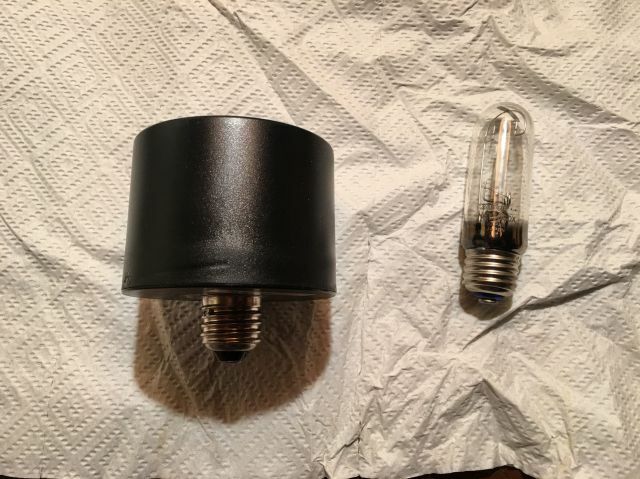 The one I have is indeed a self-ballasted reflector white HPS lamp, and was intended to replace PAR38 incandescent lamps in commercial and retail lighting applications. Yes, mine was actually designed to accommodate a reflector, but didn't come with one. I was impressed by the color, it could even makes blues pop out. That is very cool! I remember the university I went to had a number of HPS screw-in adapters for their decorative incandescent outdoor lights, and a few mercury ones. I didn't know a White SON version existed. I would assume a Philips SDW of the same wattage would also work OK on this ballast? I had noticed there is some special electronic stabilizing circuitry in the SDW magnetic ballasts. I got a 3D printer a little while ago and just realized I could make something like this... granted it would have to be low wattage since it would be made of plastic but it would still be cool.